Being Jaspers highest backpacking trail, the Skyline is a great way to experience the best the Canadian Rockies have to offer. 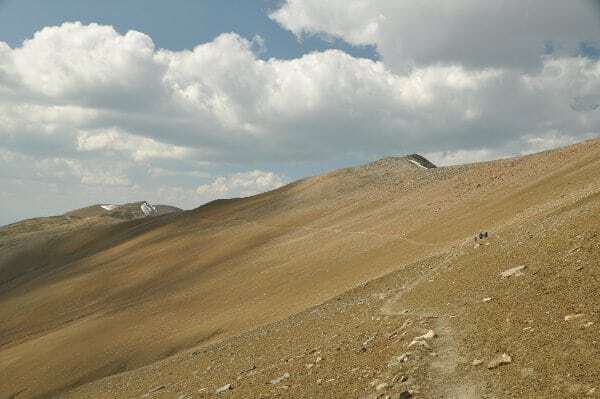 Over 20 kms of this trail are above tree-line, and the majestic views seemingly go on forever. 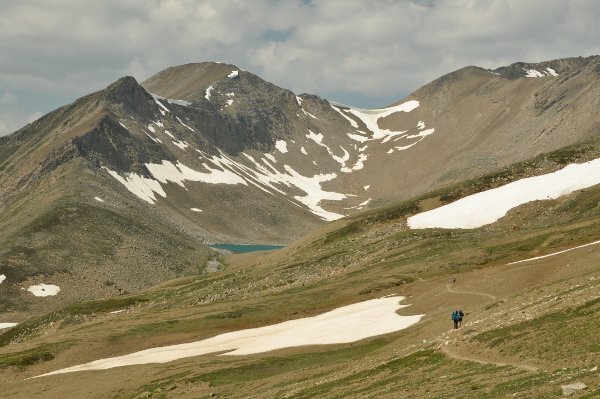 For those uninitiated to the sterile beauty of the crumbling rocky mountains, the three days spent on this trail will serve as an excellent crash course, and definitely leave you wanting more! Closest International Airport: Calgary or Edmonton, Alberta. If arriving internationally, fly into Calgary or Edmonton International Airport and rent a car. We prefer arriving in Calgary as the drive to Jasper takes you through Banff National Park and the stunning Icefields Parkway, one of the most beautiful roads on earth. The drive takes five hours to the small town of Jasper. Here you can get a hotel and spend some extra time completing some of the stunning day hikes in the region (see this page for some great recommendations). Drive from Jasper to the popular Maligne Lake to start the trail. Though this trail can be completed in either directions, we suggested going from Maligne Lake, as then there will be a net elevation loss. 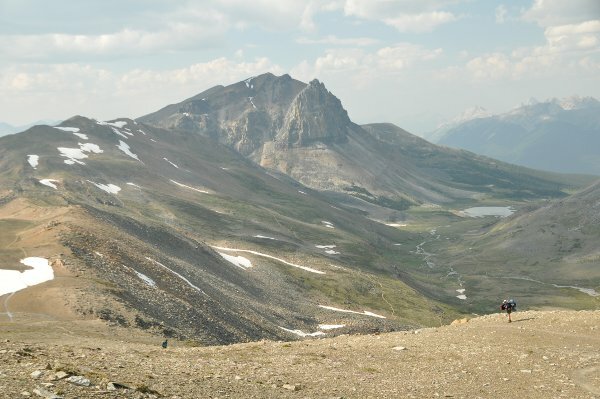 In fact, even if you’re going from Maligne Lake, there is only 1410 meters of elevation gain over the entire trail! You must reserve a spot at the designated campgrounds, and you are not allowed to camp elsewhere. This is most easily completed through the online Park Canada Website. Since this an extremely popular trail, spots run out very quickly. Book early if you intend on completing the trail. There are two trails which intersect with the skyline that can serve as emergency exit routes if the weather turns on you. 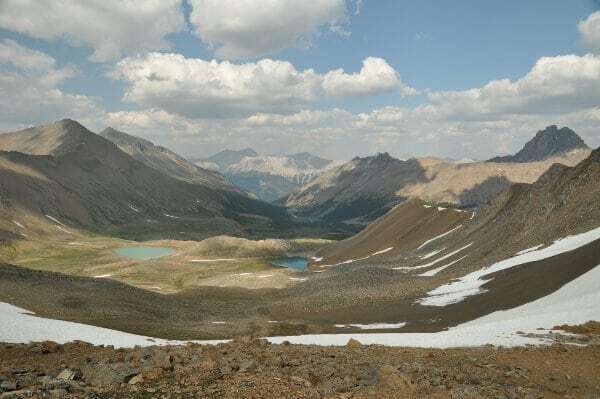 The Wasbasso trail ends on the Icefields Parkway – the main highway connecting Jasper to Lake Louise – and the Watchtower trail descends to Maligne Lake Road – the one you drove to access the trailhead.  Approximate route for Jasper Skyline Trek – don’t use this GPS for Navigation purposes! The middle day of our sample itinerary is by far the most impressive. 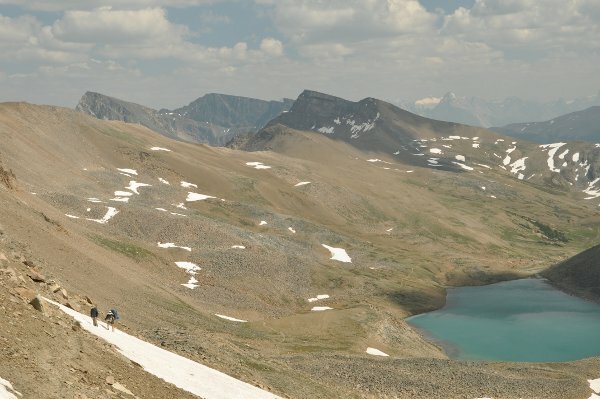 After gaining Big Shovel Pass you will hold a beautiful high traverse around to Currator Lake. You will then climb “The Notch” and continue along a completely barren ridge. The views from this section of the trail are nothing short of spectacular. Shuttles to connect the two trailheads are available. 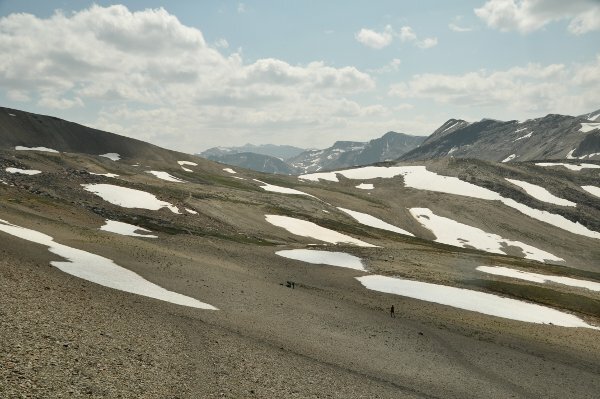 We recommend leaving your car at the Signal Trailhead then shuttling to Maligne Lake to start, as it significantly reduces frustration once you have finished the backpack. It also reduces the time between you finishing the trail and biting into a celebratory burger in Jasper. Since the trail is so high, weather can have a serious impact on your success and happiness. For example, “The Notch” can be impassable with a large snowpack. Make sure your rain gear is in working order before you start the trail, and as with any trail in the Rockies rain should be expected. When we completed the trail, we were shocked by the number of mosquitos. If you were planning on skipping the tent and just bringing a tarp we would strongly recommend that you reconsider. The bugs are frustrating enough during the day, and it is nice to be able to leave them behind for the night. Tenting is the only accommodation option on this trail. When sleeping, we were also struck by how cold it got overnight. Make sure you have a solid three season sleeping bag and a nice down jacket for the evening. Additionally, it should be noted that you need to treat or boil all the water you drink, as it is likely you’ll get “beaver fever” if you drink straight from the water.